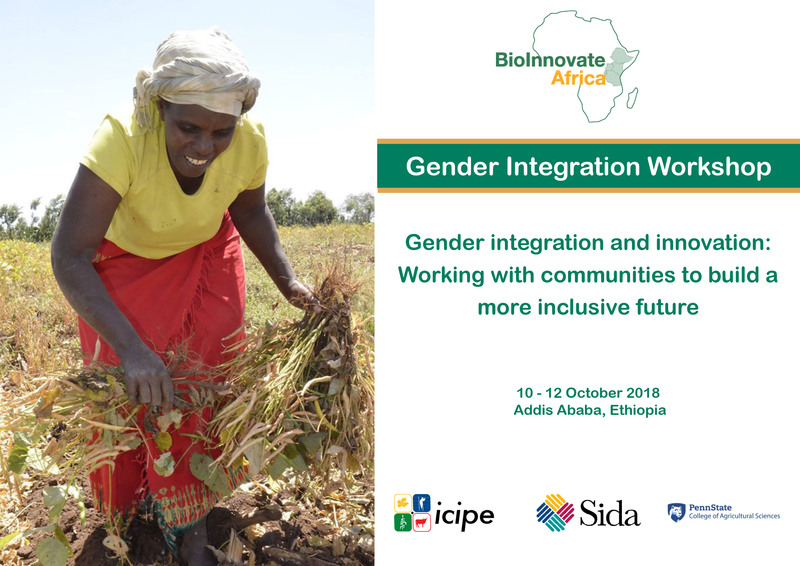 The BioInnovate Africa Programme, in partnership with Penn State University (USA) hosted a Gender Integration Workshop in Addis Ababa Ethiopia (10 – 12 October 2018). The theme of the workshop was ‘Gender Integration and innovation: working with communities to build a more inclusive future’. The objective of this three-day workshop was to equip African professionals with knowledge and skills, on how to integrate gender issues in biophysical science and innovation projects, while respecting and appreciating the cultural norms of the different stakeholders. The workshop was attended by 51 participants from Burundi, Ethiopia, Kenya, Tanzania, Rwanda and Uganda. They comprised of the BioInnovate Africa Project Teams in cohort 1 and 2, twelve fellows from the pioneer cohort of BioInnovate Africa Women Fellowship, and BioInnovate Africa and icipe staff from both Kenya and Ethiopia. The workshop was officially opened by Dr Shumete Gizaw, State Minister of Science and Technology in the Federal Republic of Ethiopia. The Minister acknowledged the diversified and pragmatic approach of BioInnovate and the conversion of research into everyday products and services. He highlighted that women represent 50% of the world’s human resources and enhancing their capability and developing their capacities will benefit institutions and the national economies. Gender integration is more than a goal. It is a prerequisite for meeting the challenges that are inherent in the society, promoting good governance and sustainable development for Eastern Africa. The BioInnovate Africa Fellowship for Women Scientists was officially inaugurated and the first cohort of fellows have now began their fellowships within the BioInnovate projects . The twelve fellows are drawn from different countries in Eastern Africa.